Having been billed as Scotland's only season long passage race event the West Highland Offshore Series saw a total of 70 boats compete across events run by five west coast sailing clubs in 2015. Building on the success of the event its back this year with a very similar list of events counting towards the series results. With the profile of the series building there are new awards for the 2016 season. The Sonas Group owners of the luxurious Duisdale House Hotel on Skye are providing luxury hospitality prizes for the top three skippers. While its not just about the winning with Ardfern Yacht Centre showing their support for the series with a new trophy. 'Esprit de Parcour' Award - New for 2016 event. 'As long standing sponsors of the popular Oban Sailing Club Round Mull Race; one of the events included within the West Highland Offshore Series we realise the popularity of the passage race type events which are more appealing to many sailors than the round the cans type racing. When Skye Sailing Club launched the series we thought it was a great concept adding a new angle to the traditional west coast events and were keen to get involved. 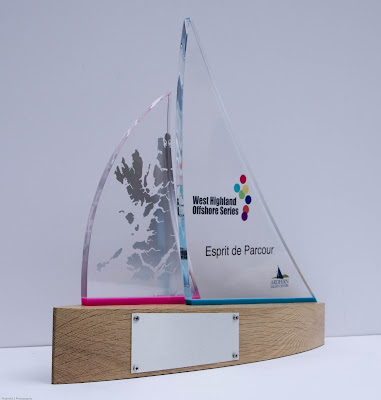 The new Ardfern Yacht Centre 'Esprit de Parcour' trophy is in the Corinthian Spirit and will be awarded to the boat finishing the season with the highest number of qualifying miles raced. You don't need all the hi-tech sails and fancy gear to win this lovely trophy you only have to finish the events.' explained Mark Cameron, General Manager of Ardfern Yacht Centre. 03 June – Glencoe Regatta Feeder (Oban - Glencoe). 10/11 June – St.Kilda Challenge (Sound of Harris -St.Kilda archepelago- Sound of Harris). 17/18 June – Midsummer in the Minch (Overnight, Portree - The Shiants - Gairloch). TBC June – Gairloch Big Boat Race (Gairloch - islands and islets - Gairloch). 1-3 July – Round Mull Race (Oban to Oban (Mull to port)). 16 July – Kyles' Cup 1 (Kyle of Lochalsh - Portree). 17 July – Kyles' Cup 2 (Portree - Kyle of Lochalsh). 30 July – Frithard Trophy (Plockton - Inner Sound - Plockton). 6 August – Round Raasay Pursuit (Raasay). Remember by entering any of the above events you automatically enter the series, no additional paper work required.